The Escambia County Sheriff’s Office SWAT team was called out Saturday morning to diffuse an armed disturbance. The SWAT team was dispatched to the 4900 block of Birch Avenue. 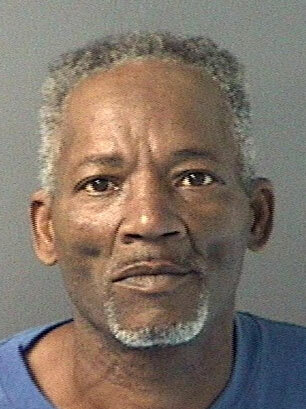 The suspect, identified as 56-year old Tommy L. Allen, was wanted for aggravated battery against his roommate after he threw boiling water on him overnight, deputies said. He had returned to threaten him again Saturday morning with a machete. The SWAT unit arrived shortly after 9 a.m., and by 9:30 a.m. Allen was taken into custody without incident. He was booked into the Escambia County Jail without bond. A Molino man was killed in a single vehicle wreck not far from his home early Saturday morning. 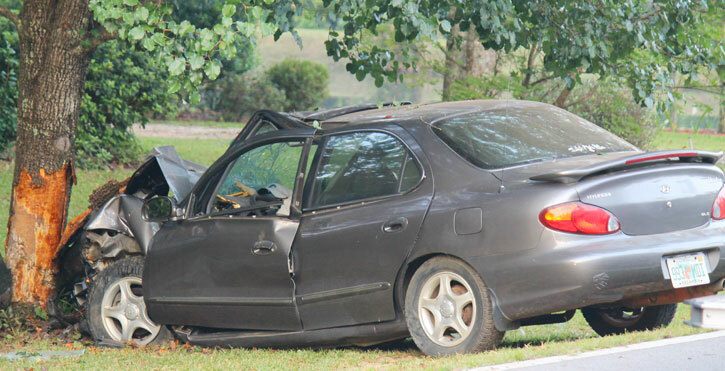 The Florida Highway Patrol said 29-year old Bryan A. Hart of Molino was westbound on Barrineau Park Road about 3:50 a.m. when he lost control of his 2000 Hyundai Elantra. The vehicle traveled across the eastbound lane of Highway 196 and off the roadway onto the south shoulder where the front of the vehicle struck a tree. Hart was pronounced deceased at the scene. According to the FHP, Hart was not wearing a seat belt. 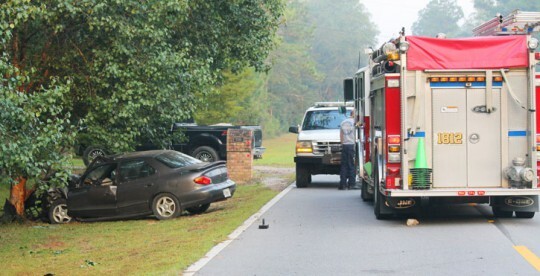 The Molino Station of Escambia Fire Rescue, Escambia County EMS and the Escambia County Sheriff’s Office also responded to the accident. 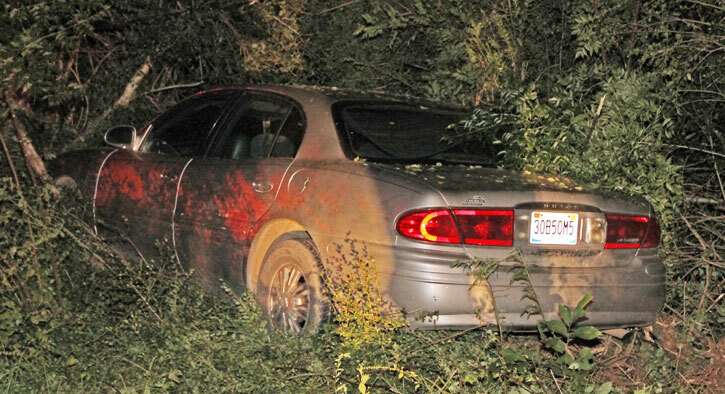 Pictured: A Molino man was killed in this single vehicle accident on Barrineau Park Road about 3:50 Saturday morning. NorthEscambia.com photos, click to enlarge. 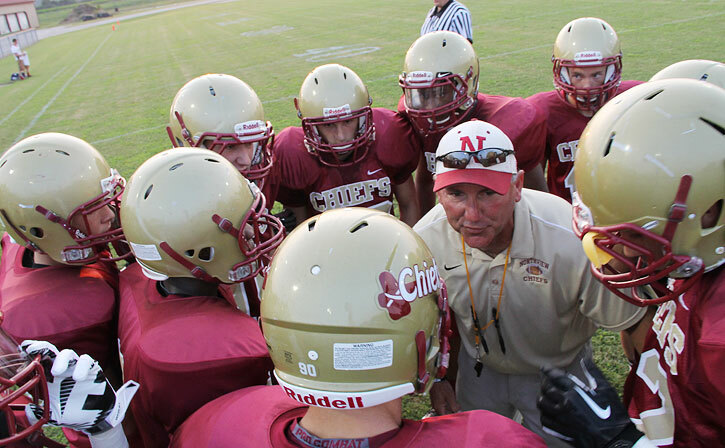 The Northview Chiefs defeated the Panama City Bozeman Bucks Friday night, 34-14, in a non-district game. And even though it was win for the defending 1A state champs, at times it was just a plain sloppy game, according to Northview coach Sid Wheatley. Most of the mistakes, he said, were the little things that the team will have to work to drill into their minds. 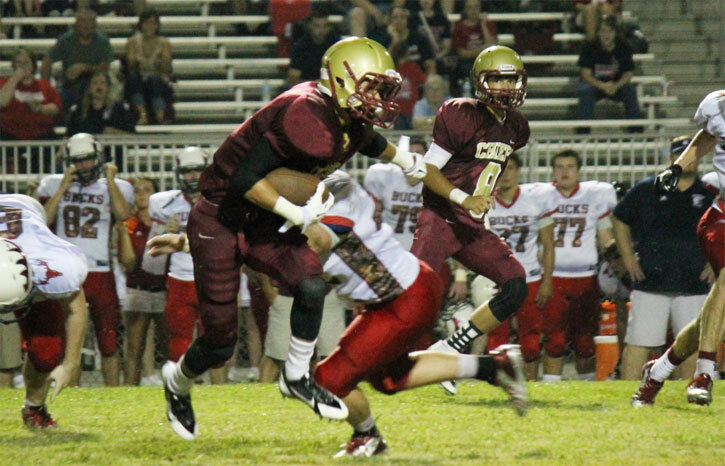 For a football action photo gallery, click here. Cheerleading, band and dance team photos will be published Sunday. Despite the problems, Wheatley said there was also a lot of good in Friday night’s game for the No. 1 ranked Chiefs. The first touchdown of the game did not come until about three minute before the half. Quarterback Daulton Tullis found Brannon Freeman with 11-yard pass. A missed point after, and the Chiefs were on the board 6-0. The Chiefs expanded their lead to 14-0 at the half with an 8-yard touchdown from Neino Robinson and a good two point conversion from Dezmine Moorer. The defending state champs increased their lead to 20-0 on a Tullis to Nathan Shipps pass from the nine. Bozeman got on the board, 20-6, before Northview struck again with a 43-yard Robinson touchdown and a good extra point, 27-6. With a 35-yard touchdown run by Shipps and a two pointer from Shipps, Northview was up 34-6. 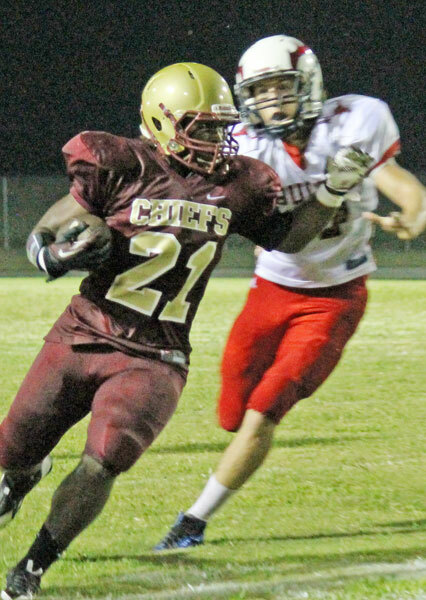 The Chiefs will be on the road next week to take on the Bulldogs of Marianna at 7 p.m. Last year, the Chiefs lost to Marianna 48-42 on an overtime forth down with a fumbled ball just inches from the goal line. 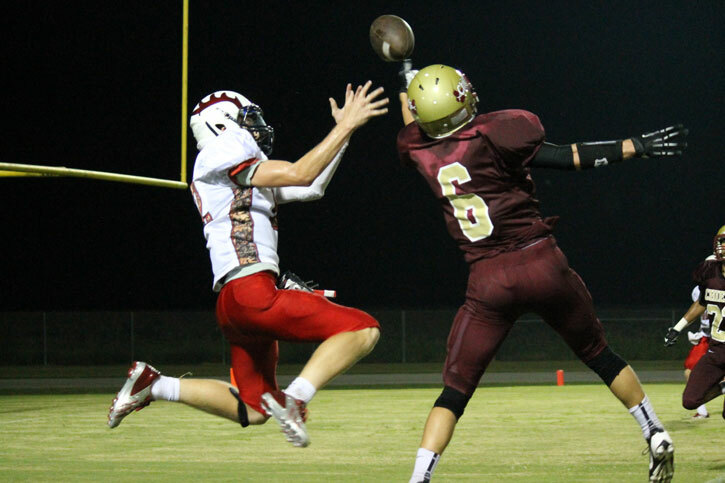 Pictured top: Northview senior Brannon Freeman tips the ball away from a Panama City Bozeman Buck Friday night in Bratt. Pictured top inset: Northview’s Neino Robinson tries to evade a tackle. Pictured bottom inset: Junior Ladarius Thomas gains yardage for the Chiefs. Pictured below: Northview coach Sid Wheatley motivates his No 1. ranked Northview Chiefs during a huddle Friday evening. NorthEscambia.com photos, click to enlarge. 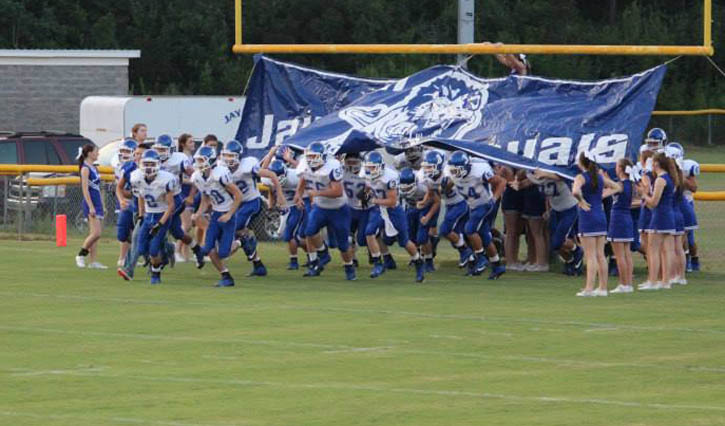 The West Florida Jaguars defeated the Tate Aggies Friday night, 45-3, at Woodham Middle School. The Aggies strongest showing came in the first quarter, allowing the Jags just 7 points on a run by quarter back Joey Baker. Tate answered with a field goal from Dylan Mancuso to keep it a close 7-3 at the end of the first quarter. 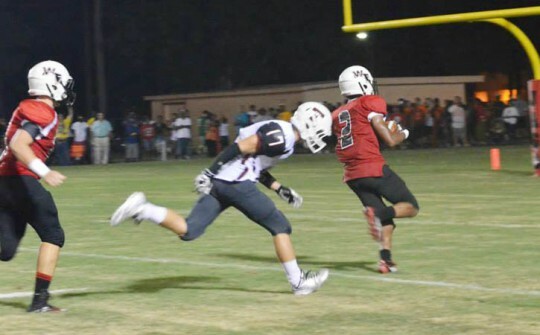 Baker was in again on a QB keeper in the second half, followed by a touchdown for the Jags from Daylan Abrams. West Florida was up 21-3 headed into the half. In the second half, 11 plays totaling 80 yards ended with an 11-yard run by Lawrence Lee, 28-3 Jaguars. The Jaguars went on to win with Lee returning a touchdown, a Vonche Hale touchdwon. and a field goal from kicker Tristan Parsley. 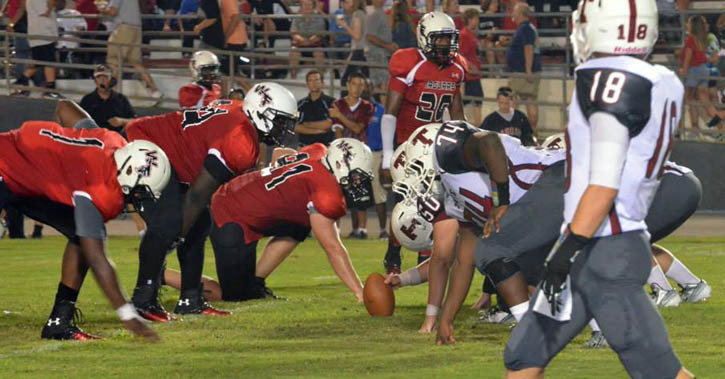 West Florida will host Milton next Friday night at 7:00, while the Aggies will be at home against Pensacola High School’s Tigers at 7:30 p.m.
Darryl Singleton contributed to this report. NorthEscambia.com photos by Kristi Smith, click to enlarge. 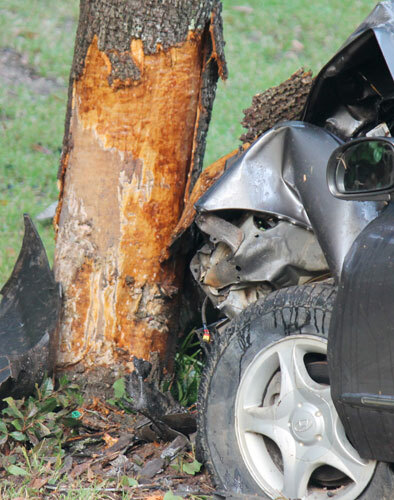 One person was injured in an early morning crash in Nokomis, Fla. 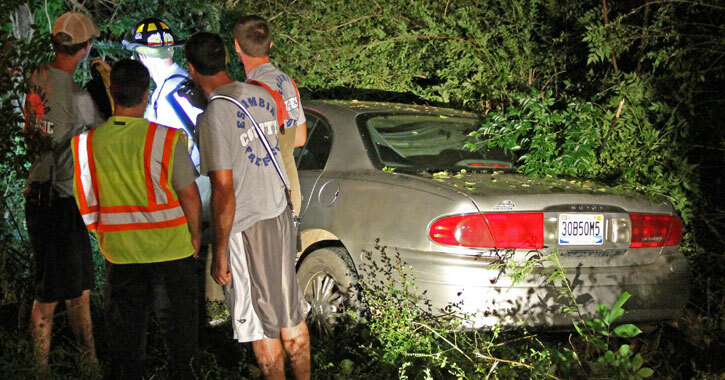 The female driver apparently lost control while attempting a negotiate a curve and ran off the roadway. She was transported by Atmore Ambulance to Atmore Community Hospital with injuries that were not considered serious. 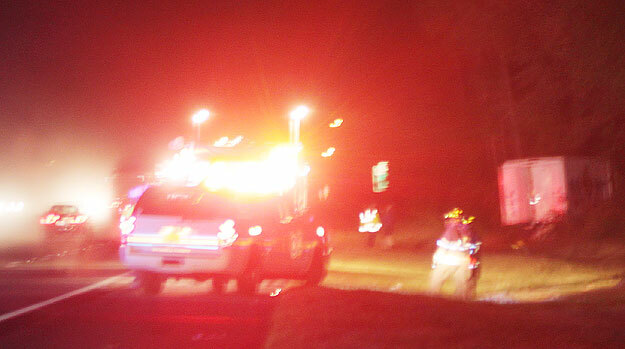 The 12:35 a.m. accident is under investigation by the Florida Highway Patrol. The Walnut Hill Station of Escambia Fire Rescue and the Escambia County Sheriff’s Office also responded to the crash. Four people have been charged with stealing over a half ton of copper wire from International Paper in Cantonment. Thomas Donald Cox, 37, Travis Wayne Hancock, 22, Jacques Pierre Richard, 34, and William Maxwell Stewart, 24, were all charged with grand theft and released from the Escambia County Jail on a $5,000 bond each. IP Security contacted the Escambia County Sheriff’s Office to report they had located copper wire that was taken from the Cantonment facility by a group of contract workers. Deputies contacted the suspects and each gave a written confession, according to a Sheriff’s Office report. Approximately 1,220 pounds of copper wire was recovered and returned to International Paper. A vehicle was seized, and deputies learned that other copper wire stolen from IP had been transported to an Alabama recycling center 10-15 other times. Saturday Night: Isolated showers and thunderstorms before midnight. Partly cloudy, with a low around 72. South wind around 5 mph becoming calm in the evening. Chance of precipitation is 20%. Sunday: Scattered showers and thunderstorms, mainly after 1pm. Partly sunny, with a high near 91. Light southwest wind becoming south 5 to 10 mph in the afternoon. Chance of precipitation is 40%. Sunday Night: Isolated showers and thunderstorms. Partly cloudy, with a low around 71. South wind around 5 mph. Chance of precipitation is 20%. Labor Day: Scattered showers and thunderstorms, mainly after 1pm. Mostly sunny, with a high near 92. Southwest wind around 5 mph. Chance of precipitation is 40%. Monday Night: Isolated showers and thunderstorms. Partly cloudy, with a low around 72. Southwest wind around 5 mph. Chance of precipitation is 20%. Tuesday: Scattered showers and thunderstorms. Partly sunny, with a high near 91. West wind around 5 mph. Chance of precipitation is 40%. Tuesday Night: Isolated showers and thunderstorms. Partly cloudy, with a low around 71. South wind around 5 mph becoming calm in the evening. Chance of precipitation is 20%. Wednesday: Isolated showers and thunderstorms. Mostly sunny, with a high near 92. Chance of precipitation is 20%. Wednesday Night: Partly cloudy, with a low around 71. Thursday: Isolated showers and thunderstorms. Sunny, with a high near 91. Chance of precipitation is 20%. Friday: Mostly sunny, with a high near 90. An Escambia County woman is facing up to 35 year in prison after being convicted of DUI manslaughter for a crash on I-10 last October that claimed the lives of an adult and a child. Kimberly Renee Rodrigues was convicted of two counts of DUI manslaughter, one count DUI causing great bodily harm and one count DUI causing property damage. She was convicted following a two-day trial. She will be sentenced November 14. The Florida Highway Patrol says Rodrigues was traveling west on I-10 near the Pine Forest exit about 4:40 a.m. on October 21, 2012,. 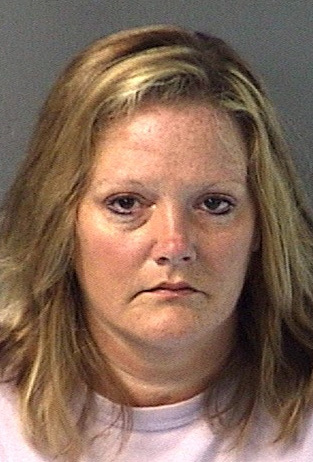 Prosecutors said he was traveling approximately 86 miles per hour when she slammed into the rear of a delivery truck driven by Melissa Lynn Lyublanovits, 44, of Pensacola. Moments later, a GMC Yukon driven by Riviera Beach resident Lovett Cummings approached in the outside lane and swerved to avoid Rodrigues pickup. Cummings barely missed Rodrigues’ truck but his Yukon then rolled several times before coming to a rest in the trees on the north shoulder of the Interstate. 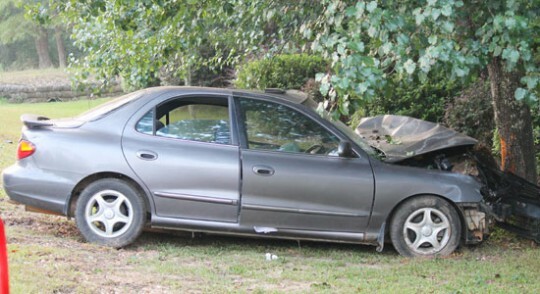 His 11-year old son, Lovett Deshun Cummings II, was ejected and died on the scene, while his 71-year old father, Lovett Junior Cummings, was also killed in the crash. Cummings’ mother was seriously injured and was Life Flighted from the scene. The delivery truck driver was unhurt. Shortly after the crash, Rodrigues’ blood alcohol content was determined to be 0.166/0.170, over twice the legal limit. Judge Joel Boles remanded Rodrigues into custody until her sentencing. Pictured above: A pickup involved in an October accident on I-10. (Note: The tractor-trailer in the photo was not involved in the crash. )The scene on I-10 in Pensacola where two people were killed in a multi-vehicle accident. NorthEscambia.com photos, click to enlarge. Pictured top: The Northview Chiefs beat the Bozeman Bucks 34-14 Friday night in Bratt. NorthEscambia.com photo, click to enlarge. The Jay Royals beat Cottage Hill 18-12 Friday night in Mobile, Ala. 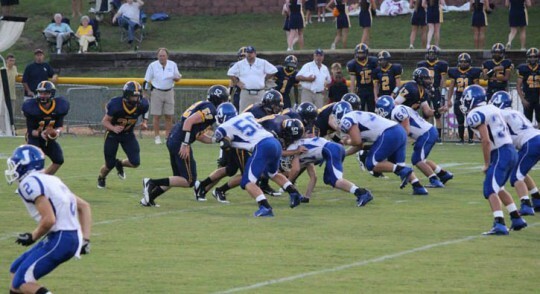 The Royals (1-0) will host Rocky Bayou next Friday night, September 6. Jay’s next game, September 13, will be an early homecoming for the Royals. The Jay quarterback Tate Upton put the Royals on the booard with a 17-yard touchdown run. 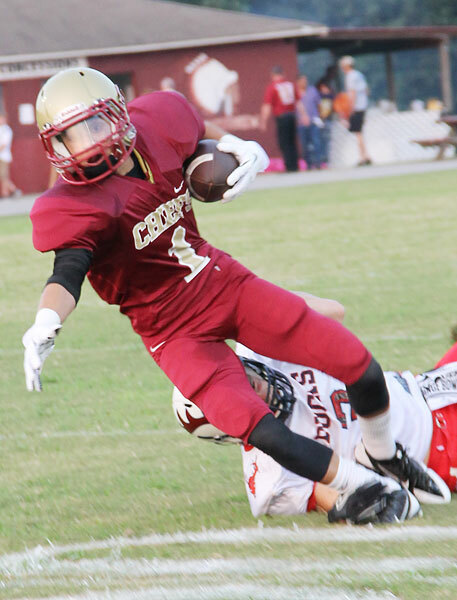 Braden Cross also added two touchdowns for Jay. Photos by Michele Gibbs for NorthEscambia.com, click to enlarge.